snowdeal.org > ex machina: the eric update - day 407: making mamma a card! or happy birthday to kris! the eric update - day 407: making mamma a card! or happy birthday to kris! august 15th is not just the day that thomas edison made his very first phograph recording ( curiously the honor went to "mary had a little lamb" ) and the first day of the woodstock festival - it's also kris' birthday! i thought it might be nice to see if odin wanted to try his hand at making mamma a personalized birthday card ( o.k. maybe some might remember that odin signed my father's day card, and you'd be wrong and cynical if you thought i was trying to "one up" kris on her fantastic idea. wrong, i say! ) with some super sized crayons. although he demonstrated a superb crayon grasping technique we still managed to get more on the highchair table than the paper itself. but we'll still give him an "A+" for effort. 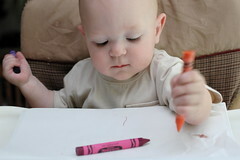 and did i already mention his outstanding ability to hold and manipulate the crayon?! i guess before we can even broach the subject of learning to color between the lines, we'll have to work on emphasizing that paper and crayons are not actually food. perhaps we're confusing things by being artsy in his highchair. 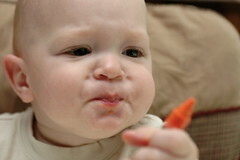 regardless, while orange might be a nifty color, it sure doesn't look like it tastes very good. for a bit of perspective, it's interesting to look back at what we were doing last year for kris' birthday when the biggest event of the day occured when she got to hold him for the very first time after he was put back on a ventilator after "crashing" and "improving" meant contracting pneumonia.